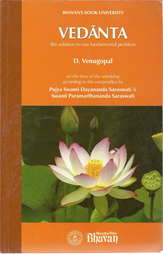 D. Venugopal is a student of Swami Paramarthananda and a direct disciple of Pujya Swami Dayananda. He has successfully completed the long-term residential course in Vedanta and Sanskrit conducted from May 2002 to July 2005 at the Arsha Vidya Gurukulam, Anaikatti.
. Available from Bharatiya Vidya Bhavan centers at London, New York and Sydney.
. Also through the IBH Books & Magazines Distributors Pvt. Ltd. - contact contact@ibhworld.com. In case of difficulty,pvsankarankutty@bhavan.info can be contacted. Should not jïäna be combined with karma togain mokña? Are not alternative means available to gain mokña? Is not the elimination of thoughts the only means for self-realization? Does not the enquiry “Who am I?” reveal the self? Is it not necessary to remove väsanäs to gain mokña? Is not knowledge to be realized through experience?